This traditional love seat pairs beautifully with the matching sofa to create a comfortable and spacious seating group for your formal or casual living room, family room or den. 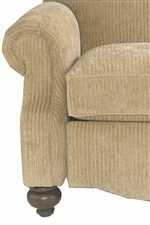 Rolled arms, a shaped apron and a tight sectioned seat back lend the love seat a unique blend of comfort and support. Details like shaped wooden bun feet and decorative nail heads further enhance the love seat's classic design. Available in fabric, leather and fabric/leather combination. The Club Room Traditional Love Seat by Bassett at AHFA in the area. Product availability may vary. Contact us for the most current availability on this product. Arm Shaped arms and nail head trim.